Ms. Blye is responsible for the financial strategy, financial reporting, investments and performance, revenue cycle and supply chain across Montefiore Health System and Albert Einstein College of Medicine. Ms. Blye has a distinguished background in large, complex healthcare organizations. Prior to joining Montefiore, she served as Executive Vice President and Chief Financial Officer of Catholic Health Services of Long Island, an integrated healthcare delivery system comprising six hospitals and three nursing homes. Earlier, she served as Executive Vice President for Finance and Integrated Services at Catholic Health Initiatives, a health system with 78 hospitals in 20 states. Her previous experience includes responsibility for treasury management, revenue cycle, financial reporting and planning, third-party contracting, supply chain, accounts payable, payroll, and information technology. Ms. Blye is a Certified Public Accountant and a member of the American Institute of Certified Public Accountants and the Healthcare Financial Management Association. Lynn Richmond is the Executive Vice President and Chief Strategy Officer for Montefiore Medicine with responsibility for Strategic Planning, Public Affairs, Government and Community Relations and Health Policy, Community Relations and Community Health. In this role, Ms. Richmond guides the organization's strategic direction and its relationships with external constituents, including elected and governmental officials, community and the public, as well as leading the development and implementation of an integrated, enterprise-wide strategy across Montefiore and Einstein. She is the executive responsible for Montefiore's participation in the New York State/Federal Waiver program known as DSRIP and oversees DSRIP initiatives. Ms. Richmond began her career at Montefiore Rikers Island Health Services in 1990 focusing on public health. Since then, she has served in a series of increasingly responsible roles in key areas including regulatory oversight, quality care and, most recently, as member of the Montefiore Einstein Center for Bioethics, before moving over to assume responsibilities in the Office of the President and CEO. She was appointed Executive Vice President in Fall of 2014. Ms. Richmond is a member of the Board of Directors of Albert Einstein College of Medicine, White Plains Hospital, Morris Heights Health Center, Montefiore Insurance Company, Inc., the Bronx Regional Health Information Organization (Bronx RHIO), Mosholu Preservation Corporation, The Healthcare Association of New York State (HANYS), and the Business Council of Westchester (BCW). She was appointed President of the Bronx Accountable Healthcare Network/Montefiore ACO in 2016. She also serves as Board Alternate for the Health Care Advancement Program (H-CAP), a national labor/management organization that promotes innovation and quality in healthcare career education, as well as a member of the Montefiore-Einstein Center for Bioethics. Ms. Richmond served as Co-Chair for the New York State Department of Health's Value Based Payment (VBP) Subcommittee on Technical Design and is a member of the VBP Workgroup. She is an Adult Nurse Practitioner specializing in Primary Care. She holds a Bachelor of Arts from the University of Michigan, a Bachelor's of Science from Columbia University and a Master of Science from Hunter College. Alfredo Cabrera joined Montefiore in 2012 as Senior Vice President and Chief Human Resources Officer. He leads human resources across the organization, including all strategy, policies and practices. Cabrera has broad experience in Human Resources strategy, change management, organizational design talent development and executive coaching with a focus on cultivating collaborative and respectful work environments. He brings to Montefiore extensive experience working in complex organizations globally. Prior to joining Montefiore, he spent 20 years at PepsiCo, directing personnel for South America, staffing for Pepsi Cola International, and then leading the HR strategy globally for R&D Beverages and PepsiCo Flavors. He has also held human resources positions at Exxon Argentina across the organization, from headquarters to operations in the field. 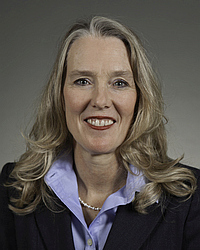 Susan Green-Lorenzen has been associated with Montefiore for nearly three decades. She began her career as a staff nurse and served in a variety of progressive positions before being appointed Senior Vice President, Operations in 2009. Green-Lorenzen is responsible for overseeing operations at the Moses, Einstein and Wakefield Campuses, as well as at The Children's Hospital at Montefiore and all hospital-based ambulatory care programs. Throughout her career, Green-Lorenzen has created new and innovative programs and developed high performing healthcare teams. With a particular interest in performance improvement, she has focused on improving the patient experience. She has led projects focused on quality of care and improving patient access to services, as well as the flow of patients throughout the hospital. Andrew D. Racine, MD, PhD is System Senior Vice President and Chief Medical Officer at Montefiore Medical Center and Professor of Clinical Pediatrics at the Albert Einstein College of Medicine. He is responsible for Quality and Safety, Medical Affairs, Graduate Medical Education and the 22-site Montefiore Medical Group. Dr. Racine joined Montefiore in 1992 as Chief of the Division of General Pediatrics where he was responsible for two large academic practices that include attending pediatricians as well as pediatric residents. Before that, he served as Associate Director of Pediatrics at Jacobi Medical Center and as a faculty member in the Division of General Pediatrics at Columbia-Presbyterian Medical Center. On a national level, Dr. Racine has been active in the American Academy of Pediatrics (AAP), serving as Chairman of the Advocacy Committee and Vice-President and President of Chapter 3, District II. He also serves on the National Committee on Child Health Financing of the AAP and has achieved national recognition for his work on the use of hospital data to measure the effect of policy changes on health outcomes. Dr. Racine has received numerous awards, including the Lewis M. Fraad Award for Excellence in Teaching and the Emily Fenichel Award for Leadership in the New York Zero to Three Field. He was inducted into the Leo M. Davidoff Society of Albert Einstein College of Medicine for excellence in teaching. Dr. Racine completed his undergraduate education at Harvard and holds combined doctorates in medicine and economics from New York University. He trained at Harvard’s Boston Children’s Hospital and went on to join the faculty of Columbia University College of Physicians and Surgeons. Chris Panczner is the Senior Vice President and General Counsel of Montefiore. As a member of the senior management team since 2008, he oversees the operation of the Office of Legal Affairs, Compliance Department, Audit Services Department and the legal aspects of the Risk Management Department. Panczner's broad legal experience in healthcare law, large commercial and not-for-profit healthcare transactions, as well as managed care structures and transactions will serve Montefiore well in the coming decade of healthcare reform. Prior to his appointment at Montefiore, Panczner was Senior Vice President and General Counsel at Saint Vincent Catholic Medical Centers in New York City and a senior partner at Epstein Becker & Green. Panczner has been an Adjunct Professor in the Health Law Program at the Pace University School of Law. As Senior Vice President - Facilities and Real Estate, Mr. Pfleging leads Facility and Real Estate operations across the Montefiore Health System and Albert Einstein College of Medicine. He is responsible for Engineering, Design and Construction, Real Estate, Environmental Health and Safety, Medical Equipment Engineering, Telecommunications, Security, Housekeeping, Food Services, Parking and Mail Services. Mr. Pfleging has been associated with Montefiore for over 25 years, initially as an entry-level engineer and advancing in various positions of greater responsibility before being promoted to Senior Vice President in 2015. Mr. Pfleging is a registered Professional Engineer in the State of New York, holds a Bachelor of Engineering degree from SUNY Maritime College, a Masters of Business Administration from Manhattan College, and is a Certified Energy Manager and Energy Procurement Professional by the Association of Energy Engineers. Mr. Pfleging was re-elected Councilman in his home town in 2015 and has served on the Planning Board and Zoning Board of Adjustment. Mr. Pfleging has also been an Adjunct Professor of Engineering Economics at SUNY Maritime College in the Bronx. Stephen Rosenthal is Senior Vice President - Population Health Management for Montefiore’s integrated delivery system and President of CMO, Montefiore Care Management, a wholly owned for-profit subsidiary of Montefiore Health System. Mr. Rosenthal has been a leader in the development of programs and initiatives in Care Management interventions. These programs and those for the frail and vulnerable populations have supported the growth of Montefiore’s integrated delivery system, and its provider network of approximately 5,000 physicians, its Home Health Agency, Rehabilitation Facility and acute care hospitals. Prior to his current position, Mr. Rosenthal served as Vice President of Montefiore’s Professional Services, where he developed and managed Montefiore’s Faculty Practice of employed physicians. Earlier in his career, he practiced as a Clinical Audiologist. He is also an Associate in the Department of Epidemiology and Social Medicine at Albert Einstein College of Medicine. Peter P. Semczuk serves as Senior Vice President and Executive Director of the Moses and Wakefield Campuses, Montefiore’s largest campus which includes Montefiore Hospital and the Children’s Hospital at Montefiore. He is well known for his work in emergency services, having overseen the expansion of Montefiore’s Department of Emergency Medicine to the second busiest in the nation. Dr. Semczuk has lectured extensively and received numerous awards in patient satisfaction from eminent industry organization including Press Ganey and Studer Group. Prior to joining Montefiore, Dr. Semczuk was the Associate Director of Operations at North Central Bronx Hospital, a position which primarily focused on leadership development and performance improvement. He holds a BA in Economics from Hofstra University, a MPH from Columbia University and a DDS from New York University. He also completed his general practice residency at the VA Medical Center in Brooklyn. He is a fellow of the New York Academy of Medicine and was recently profiled as one of the Healthleaders 20 who are making a difference in healthcare. Jack Wolf is Senior Vice President & Chief Information Officer for Montefiore Health System, and he serves as President of Montefiore Information Technology (IT). In his nearly 30 years with Montefiore, he has held various positions, including Director of IT and Vice President and Chief Information Officer. Prior to joining the health system, Mr. Wolf worked in the retail and accounting industries. He holds a Master’s Degree in Management/Finance from Rutgers University and a Bachelor’s Degree in Accounting from William Patterson University. Mr. Wolf is a member of the Greater New York Hospital (GNYHA) HIT Steering Committee and the Premier Alliance Healthcare HIT Steering Committee. He is also a member of The Healthcare Advisory Board, College of Healthcare Information Management Executives and Healthcare Information and Management Systems Society.